C2 Music Video Making 2014 ~ Philippine Freebies, Promos, Contests and MORE! Didn't make the cut in last year's MTV submission? 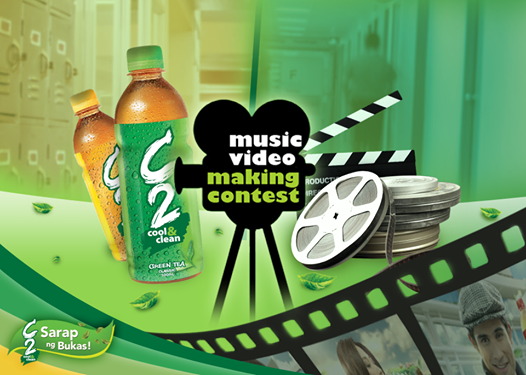 There's still time to submit your entry for the C2 Music Video Making 2014. Just like in the previous competition, you must be able to create a unique music video displaying your own interpretation of the "Sarap ng Bukas" concept. Download the C2 Sarap ng Bukas mp3 song, interpret it using your own music video, then upload it online upon registration. Make sure to feature any of the C2 Cool and Clean Green Tea variants in any pack size (Classic, Apple, Lemon, Orange, Peach, Sugar-free Apple, Milky Tea). Let all your friends vote for your entry for more chances of winning P200,000 + C2 goodies worth P10,000 (Grand Prize), P100,000 + C2 goodies worth P5,000 (First Runner Up), P50,000 + C2 goodies worth P2,000 (Second Runner Up), and P10,000 each + C2 goodies worth P1,000 (Other finalists). Not only that. One Fan's Choice Award winner will receive P20,000 + C2 goodies worth P2,000 and 25 Lucky Pick Voters will be entitled to C2 premium items. Best Video - Music video entries garnering the top 10 highest scores based on the judges' scores.